An article on conscientious objection in the New England Journal of Medicine has sparked outcry among conservative bioethicists. University of Pennsylvania bioethicists Ronit Y. Stahl and Ezekiel J. Emanuel argue that medical societies should “declare conscientious objection unethical” and remove conscience clauses from their codes of ethics. According to the authors, “objection to providing patients interventions...that the profession deems to be effective, ethical, and standard treatments...is unjustifiable”. Stahl and Emanuel argue that doctors, in entering the medical profession, agree to abide by the ethical and professional standards of the profession: “By entering a health care profession, the person assumes a professional obligation to place the well-being and rights of patients at the center of professional practice.” Regardless of their personal religious objections, they “must provide the appropriate interventions as specified by the medical profession”. If vaccines are safe and effective, why worry if not everyone wants their children to have them? Oxymoron: How much will I get paid for donating my eggs? Words with new meaning. Brave New World. 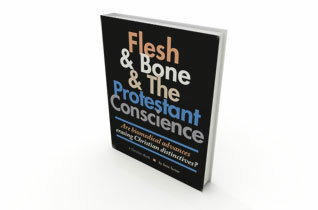 Flesh and Bone and The Protestant Conscience is an e-book on Amazon.com. It is 99¢ and in the Amazon lending library as well. It is also available here in PDF format. The book description follows. Would you let your conscience be your guide? Does God care if the skin and bone of the dead are passed along to the living for medical uses? Is organ donation OK with God? Should you sign a Living Will? Did you know that dead organ donors are often anesthetized before their organs are removed? Do you know the current definition of death? The conscience cannot function without facts. How should a Christian think about euthanasia by starvation when doctors and the state attorney general all agree it is time to withhold feeding from a brain injured patient? Some things are family matters, but someday it may be our family. Here is a small book to help you think about whether you want to sign your driver's license, donate a kidney, cremate your loved one, and many other practical questions that may arise in the course of your healthcare decisions or watch over others. It offers a special focus on the doctrine of the Resurrection that is related to such decisions. Sunday School classes and Bible Study groups could use this book to facilitate discussion about the issues covered.